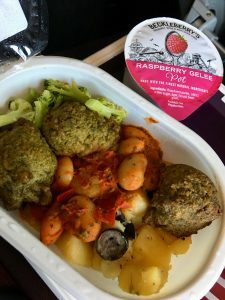 Last time I flew to New York with Virgin Atlantic I was a vegetarian and my Being Vegetarian at 38,000 ft blog post seems to be really popular so I thought I’d do one for vegan Virgin Atlantic food. Just after take off we were given the usual bag of pretzels. 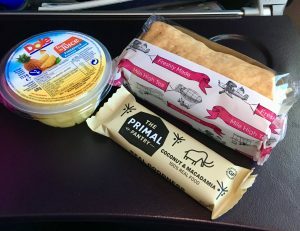 Unfortunately they were sour cream and chive flavour so I couldn’t eat them however I had been expecting this so I made sure I wasn’t hungry when I got on the plane. You also get a drink at this time – water, juice, fizzy drinks etc. About an hour or so later our food came out. I still love being one of the first to get your meal when you order a special meal! The main part of the meal was actually the same as what we had for the vegetarian meal last time which I really enjoyed. It was butter bean stew with spinach dumplings and was full of flavour. 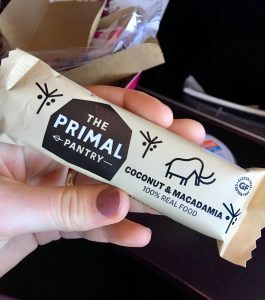 It’s probably the nicest food I’ve ever had on a plane. I remember finding it quite spicy last time so either it’s got less spicy or I’ve just got used to eating spice. 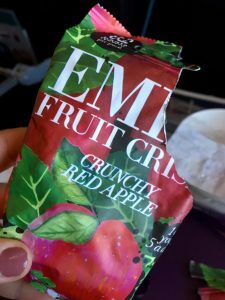 It came with Emily’s Crunchy Red Apple Fruit Crisps which were much tastier than I thought. They were quite thick and I’ll definitely be on the look out for these in shops. They’re also one of your five a day which I’m nice when you’re on a plane. 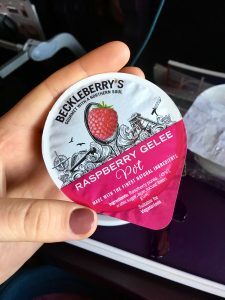 Then there was a Raspberry Gelee pot. It was quite weird. It tasted nice but the texture was kind of moussey. It came with a bottle of water and they also came round with drinks again, this time including red or white wine (no thank you dehydration)! After lunch is tea and coffee but I’m not sure if they have soya or plant milk options as I didn’t have a drink this time. About an hour before landing you get afternoon tea. Last time we had cheese and pickle sandwiches with a few snacks and it was actually the same as what everyone else had. I was unsure if I’d get a vegan version because I thought we’d all have the same again so it was a pleasant surprise when ours came out. 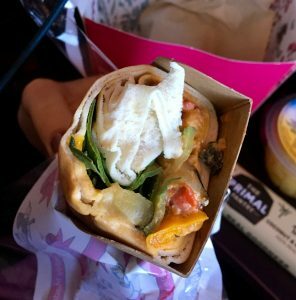 We had a roast veg and houmous wrap which I loved. My husband isn’t a big fan of this kind of thing and I’d say this is one of the disadvantages of ordering a special meal because you don’t get a choice. There was plenty to fill up on though as we also got a pot of pineapple pieces and a Coconut and Macadamia bar which was really nice. The food on the way back was not as good as on the way there. The photos are really bad because it was night and I didn’t want to disturb anyone by turning lights on so I apologise for that. 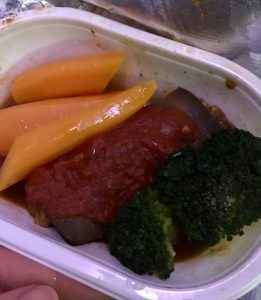 Our dinner was a sort of aubergine roll with mushrooms or something inside with carrots and broccoli with a tomato sauce. It wasn’t very flavourful and to be honest I should have just left it because the time difference meant we got breakfast a few hours later. It came with a pot of orange segments and a packet of dried apple, cranberries and raisins. Breakfast was another pot of orange segments and an oat bar a little bit like the coconut and macadamia bar we had on the way there. Our flight back was actually less than 6 hours and we had eaten a lot over the last few days so it wasn’t too much of a problem to not like some of the food. 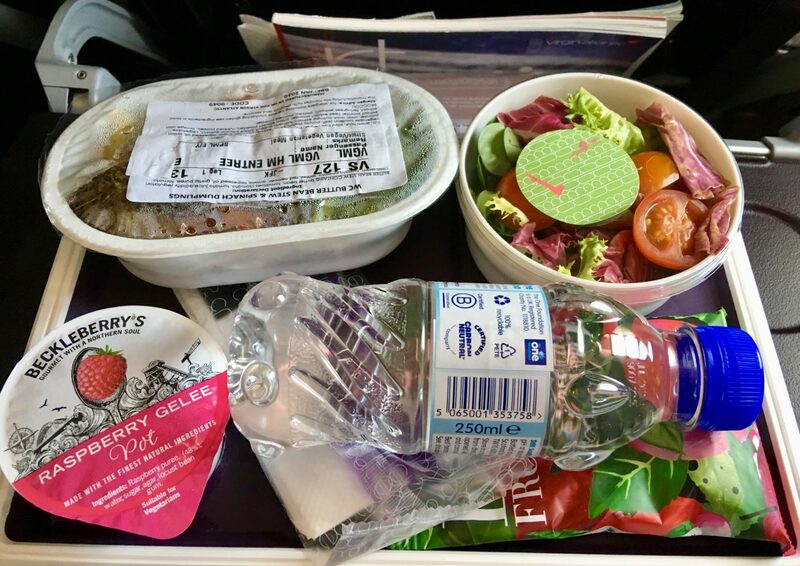 On a side note, they made an announcement that they are trying to come up with ways to reduce their single use plastic and while they are putting measures in place you can reuse your plastic cup throughout the flight to try and help a little. I’m excited to see what they come up with because I am all for reducing plastic waste! A very good vegan offering I’d say! Thanks for sharing. I love Emily’s Crisps! I always get the sweet potato ones from Waitrose. I don’t think I’ve ever seen them before but I’ll definitely be looking out for them from now on!